Today, when you order "Lightning Switch Finale JS Berry (eur)", you'll instantly be emailed a Penguin Magic gift certificate. You can spend it on anything you like at Penguin, just like cash. Just complete your order as normal, and within seconds you'll get an email with your gift certificate. 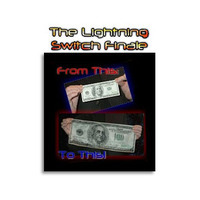 This is the ultimate finale for any bill switch routine. A $100 bill is freely shown and folded. The folded bill is displayed in the empty hands. Then, instantly, the bill transforms into a large $100 bill silk! The silk is freely shown, with no sign of the original bill. This effect sounds too good to be true, yet it really happens as described. This is powerful visual magic that is great for close-up or stage. This effect is easy to learn and comes complete with Cloaking Device, $100 Bill Silk and easy to understand, step-by-step instructions. Also available with a 50 Euro silk, same effect, and different currency.